Back in the 90’s, owning a skateboard automatically made you cool. Nowadays, traditional skateboards just don’t cut it anymore. 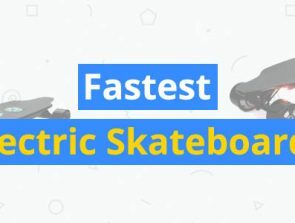 Electric skateboards have practically taken their spot in the popularity rankings since they are so easy to learn and provide an emission-free and environment-friendly way of getting around quickly. 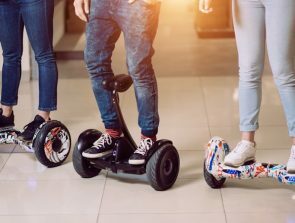 They aren’t even just for kids anymore – as a personal transporter, electric skateboards have become popular even among adults. Although they are excellent pieces of technology, we understand that not everyone is willing to shell out a huge amount to buy an electric skateboard. If you are working on a tight budget, then we made this list just for you. We have compiled a list of the best electric skateboards that cost less than $300. Although they are cheap, these electric skateboards are still extremely popular and high-quality models. The Huracane Electric Longboard from BLITZART has all the features you could want from an electric skateboard at a very friendly price. The moment you lay your eyes on the Huracane, it will be very easy to notice its premium deck built with 6 layers of maple wood and 2 layers of bamboo deck, finished with a premium grip tape. The combination of maple wood and bamboo gives the longboard some flexibility while making it durable enough to carry a maximum load of 250 lbs. 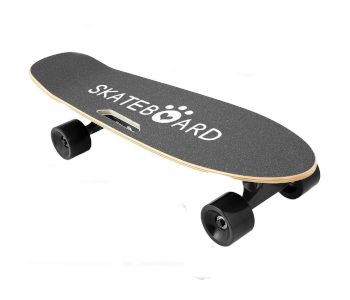 In addition to the premium grip tape, the slightly concave shape of the deck allows riders to remain firmly on the board even when riding through uneven surfaces. Beyond just its looks, the Huracane is a powerful beast. It can reach a maximum speed of 17 mph with the help of its powerful 350 W hub motor. With its 36V 4.4Ah lithium-ion battery pack, the Huracane can run up to 10 miles in a single charge. A regenerative brake system allows the Huracane to extend its battery life, while having premium hub motors means it can also be kick-pushed like a traditional skateboard. Operating the Huracane is made easy with its ergonomic handheld controller. The controller can be secured using the included wrist strap to make sure you don’t lose it even as you cruise along at top speeds. The handheld controller will allow you to control the board, acceleration and deceleration, as well as set speed limits for beginners. The Huracane is an excellent overall electric skateboard from one of the most well-known and reliable brands. At its friendly price tag, the Huracane gives exceptional value for money. The Tornado is a slightly cheaper version of the Huracane which retains all its best features. Similar to the Huracane, the Tornado features a premium deck design constructed with 6 layers of maple wood sandwiched between 2 layers of bamboo deck. With a layer of premium grip tape and a concave-shaped deck, riders can easily stay put on the Tornado even in challenging conditions. Despite the lower price tag, BLITZART has not made much reduction in the power of the Tornado. With its 350W hub motor, the Tornado can also run at a maximum speed of 17 mph. The speed of the electric skateboard can be controlled using the ergonomic handheld controller which can also be used to set speed limits for beginners. The handheld controller also doubles as a battery indicator – three LED lights provide a rough estimate for the board’s remaining battery power. With its 36V 4.0Ah lithium-ion battery, the Tornado can run up to 8 miles in a single battery cycle. Charging the battery to full capacity only takes 2.5 hours. An innovative regenerative brake system helps to extend the battery life of the Tornado. The Tornado comes out of the box ready to ride – you won’t need to spend any time putting it together. BLITZARD sells an array of accessories of various colors for the Tornado so you can customize your board in several ways. In terms of both style and function, the BLITZART Tornado is a premium electric skateboard that is available at an affordable price. 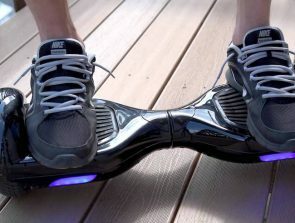 The Swagskate is an upgraded version of the super popular Swagboard from SWAGTRON. It features upgraded features and hardware that make the Swagskate the most durable and rugged Swagboard yet. The deck of the Swagskate measures 32 x 9 x 4.5, making it one of the biggest electric skateboards available today. The 7 layers of Canadian maple wood make the deck both durable and flexible, allowing to support riders up to 176 lbs. This capacity should be good enough for most adults, although the Swagskate might struggle with larger people. The Swagskate can run at a moderate maximum speed of up to 11 mph, which should be fast enough for leisurely rides or even on regular commutes. 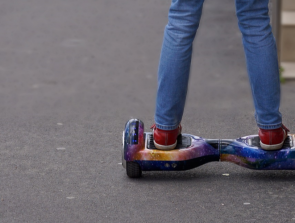 A single charge of its 24V lithium-ion battery can allow the Swagskate to run for up to 10 miles. Moreover, the proprietary Sentryshield Technology that Swagskate uses to protect its battery exceeds all existing safety requirements on battery protection. The handheld remote control that comes with the Swagskate allows you to easily control the acceleration of the Swagskate. This controller is little more sophisticated than most – it has an LCD screen that displays the current speed, and the remaining battery life of both the board and the controller. With its micro USB port, the handheld controller can be charged anywhere or even while you’re on the go. The wrist strap ensures that you don’t lose your handheld controller, even when your ride starts to get rough. A simple but useful feature of the Swagskate is the provision of two ergonomic grips on the sides of the deck, making it easy to carry around with you. With these handles, you won’t need to awkwardly tuck your electric skateboard under your arms anymore. The Swagskate is one of the cheapest premium electric skateboards available today, proving that a silky-smooth skateboarding experience does not have to cost a fortune. The Blink Lite V2 from ACTON holds the distinction of being the lightest electric skateboard in the market today. Weighing only 7.7 lbs, the Blink Lite is an extremely portable penny board that is a perfect gift for kids and beginners. The Blink Lite is designed with kids, teens, and pre-teens in mind with its easy to learn features and a 130-lb maximum weight capacity. A deck made of multiple layers of Canadian maple wood gives the Blink Lite exceptional durability and flexibility while still keeping it lightweight. A single hub motor allows the Blink Lite to travel at speeds of up to 10 mph. The fully charged battery of the Blink Lite can provide up to 5 miles of travel. Even when the battery runs out, you won’t need to worry as the Blink Lite was also designed to be operated by kick pushing, similar to a traditional skateboard. The Blink Lite seems to have been designed with young riders in mind. 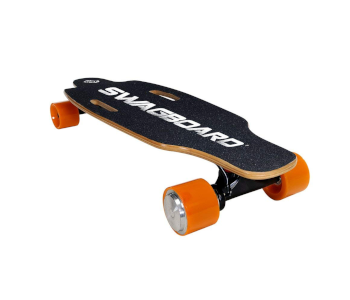 This electric skateboard comes with an array of LED lights located under the deck which keeps it highly visible when riding at night. In addition to keeping riders safe, the LED lights also look really cool. Overall, the Blink Lite is a highly portable penny board that is perfect to help young riders get around. It is the perfect electric skateboard for leisurely rides around the neighborhood or for travelling to school. With its compact design, it’s not overly powerful, but these modest specs may be just the perfectly safe conditions for kids and teens. The RazorX Cruiser is a low-cost electric skateboard that packs a mean punch. With a 125W geared rear-wheel-drive motor, the Cruiser can travel at a maximum speed of 10 mph. A 22V lithium-ion battery pack allows up to 40 minutes of continuous use. The Cruiser has larger than average deck that has a length of 29.7 inches. Its 5-layer maple wood construction makes it durable, flexible, and lightweight. With a maximum weight capacity of 220 lbs, the Cruiser is best for use by kids, teens, and even average-sized adults. At only 10.5 lbs, the Cruiser is extremely portable and can be easily carried around when you are not riding it. True to its name, the Cruiser offers a premium cruising experience. High-grip 80mm polyurethane wheels ensures superior traction even in wet surfaces and challenging terrain. Custom kingpin trucks make steering the Cruiser extremely responsive and stable. A wireless handheld controller allows you to quickly and easily regulate the speeds of the Cruiser. A highly responsive speed control makes it possible to do carve-and-turn actions, resulting in a highly dynamic and fun riding experience. 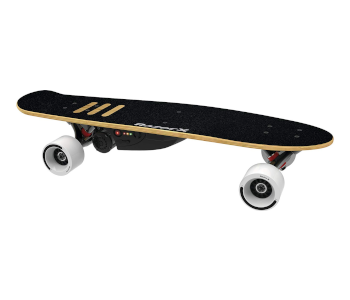 All in all, the RazorX Cruiser is a very affordable electric skateboard that delivers well in all departments. 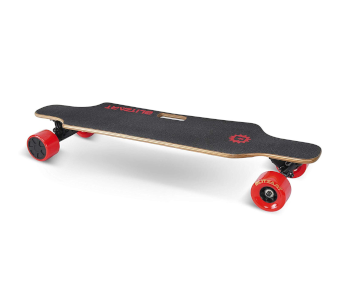 With a solid construction, smooth riding experience, and a responsive variable speed controller, the Cruiser is a solid choice for an electric skateboard in its price range. The X-Plore is another excellent and low-cost electric skateboard from BLITZART. Similar to their other models, the deck of the X-Plore is made of 7 layers of premium quality Canadian maple wood sandwiched between two layers of bamboo deck. Finally, the deck is outfitted with a premium grip tape that keeps the rider’s feet firmly in place even while riding in tough conditions. With its superior durability and flexibility, the deck of the X-Plore can support a maximum weight capacity of 250 lbs. With a powerful 350W hub motor, you can cruise along with this longboard at speeds of up to 17 mph. This is an impressive speed that should satisfy any adrenaline junky. 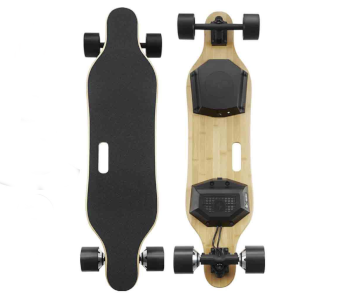 The onboard 36V 4.0Ah battery supports an operation of the skateboard for up to 10 miles of travel, while only needing two and a half hours to get fully charged. A unique quality of the X-Plore is the provision of two ergonomic handles on either side of the skateboard. This makes it easier to handle and carry the X-Plore with you when you’re not riding it. If you’re looking for an electric skateboard that you can bring along on your trips or on your morning commute, then the X-Plore is an excellent choice. The X-Plore also comes with an easy-to-hold wireless remote that can control the board’s acceleration and deceleration. The board even comes with a reverse capability, as well as pre-set speed limits for beginners. With such intuitive and responsive controls, even newbies can hop into the X-Plore and master it with minimal effort. The X-Plore is a versatile and affordable skateboard made with high-quality materials and with an intelligent design. It is slightly more portable than the other BLITZART electric skateboards, making it an excellent choice for people on the move. Weighing in at only 8.1 lbs, the MAX C electric skateboard from Maxfind is one of the lightest models you can buy today. 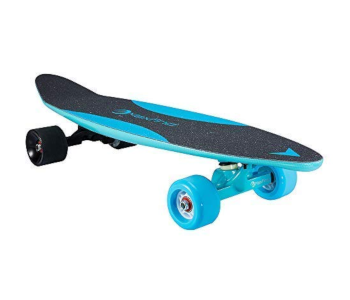 This penny board is made from durable and lightweight composite polypropylene and fiberglass, and comes in four colors: black, blue, green, and pink. Due to its small size, the MAX C is geared more for the young riders with its maximum weight capacity of only 180 lbs. Don’t let the tiny stature of the MAX C fool you: it boasts of an impressive maximum speed of up to 14mph. Its 36V 2.2Ah battery gives this electric skateboard a range of up to 8 miles on a single cycle, which can be fully charged in just 1 hour. A handheld remote control allows you to set riding modes that are designed for both advanced riders and beginners. Even with zero experience, you can zip around comfortably and easily on the MAX C. With a stiff deck flex that makes the board more stable as you approach higher speeds and a well-design carve-and-turn mechanism, you will be riding around in style with the MAX C in no time. The MAX C is a highly portable electric penny board that comes with all the features we have come to expect from electric skateboards. It is also one of the best-looking penny boards available today. The Kaluo electric skateboard amps up the style factor with the inclusion of an onboard wireless speaker that you can connect to your phone to play your favorite tunes. It even comes with a front light that you can turn on if you really want to arrive in style. This skateboard isn’t all about theatrics. With 7 layers of Canadian plank, the deck of the Kaluo electric skateboard is exceptionally resistant to splitting and deformations. It is very durable and can carry a maximum weight capacity of 260 lbs. This means that even larger adults do not have to feel excluded from riding the Kaluo skateboard. You can ride this electric skateboard rough and hard, as it is built to withstand quite the beating. Although the Kaluo electric skateboard excels in the durability department, it seems to have dialed back on the power. It has a maximum speed of around 10 mph, which is not bad for kids but might feel a little underwhelming for adults. Moreover, its full battery charge can only allow up to 6 miles of continuous travel. This is even more disappointing considering that charging the 2200mAh lithium-ion battery takes 2 to 3 hours. The Kaluo electric skateboard also comes with a handheld controller that has a clever ergonomic design. Despite its compact size, it has all the usual functions – a slow/fast speed toggle, a forward and reverse switch, and accelerate and decelerate buttons. Surprisingly for such an affordable model, the Kaluo electric skateboard has one of the highest weight capacities. It is also one of the few models that feature an onboard wireless speaker. Proving that you can’t have it all, the maximum speed and range of the Kaluo electric skateboard leaves us wanting more. 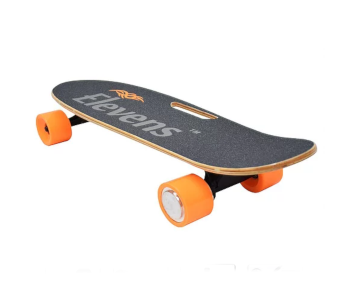 The electric longboard from Elevens is one of the cheapest in this list but shows off with a long list of premium features. An astounding 9 layers of Canadian Hard Rock maple make the deck of the Elevens longboard very sturdy and durable, allowing you to ride it hard and rough with no fear of deformation. A 120W brushless hub motor allows this longboard to reach speeds of up to 12 mph and climb hills with a gradient of up to 15 degrees. Charging the 24V 2200mAh lithium-ion battery takes around 2 hours and should give you enough juice for up to 12 miles of continuous travel. With this travel capability right in the palm of your hands, you never have to worry about traffic again. 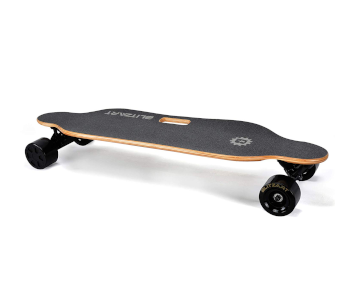 The Elevens electric longboard is equipped with extra big 2.5-inch polyurethane wheels. 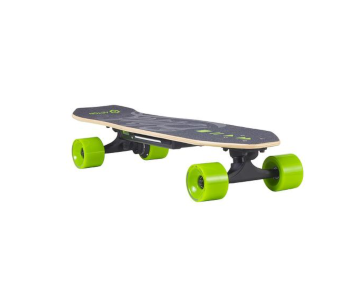 The added girth of the wheels allows the longboard to each higher maximum speed while the polyurethane material ensures good grip even on wet surfaces. The handheld remote control provides an intuitive and highly responsive way to accelerate and brake. 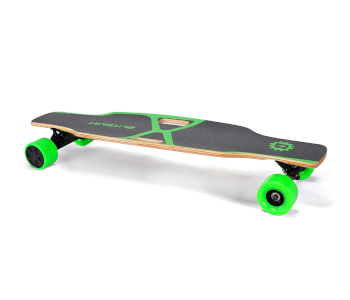 All in all, the Elevens electric longboard gives surprising value for money. Even though it is one of the cheapest skateboards in this list, it has solid numbers and an extremely durable build. The MUTTUS electric skateboard is one of the most powerful models in this list. With its 350W dual brushless hub motors, the MUTTUS can reach speeds of up to 15 mph. This skateboard can be used by both kids and adults alike with its 265-lb maximum weight capacity. With a range of up to 15 miles on a single battery cycle, the MUTTUS will prove to be a very useful companion in your regular commute. The deck of the MUTTUS electric skateboard is made sturdy with its 7 layers of high-quality maple wood. The MUTTUS seems to have been designed with safety as a top priority, as they ensure that their skateboard adheres to electrical and safety tests. Built-in LED lights make riding the MUTTUS safe to ride even at night. Similar to other models, the MUTTUS electric skateboard also comes with a handheld remote that can be used to control its speed. It also comes with a forward and reverse toggle switch, as well as a switch for low and high-speed modes. The remote control also features a set of 3 LED lights that functions as a battery indicator. Being one of the most powerful electric skateboards in this list, you surely will not be disappointed with the MUTTUS electric skateboard. Its 350W dual motors with built-in super cooling performance may be one of the best designed motors for an electric skateboard. In terms of safety, durability, and ease of use, the MUTTUS does just enough to hit all the right marks. Gone are the days when skateboards were used primarily for leisure. Electric skateboards are a cool, stylish, and environment-friendly to get around. They are more portable than electric scooter but have a more rugged build compared to hoverboards. The list we have compiled here proves that you do not have to spend a fortune to buy a high-quality electric skateboard. The models we chose are all very durable, easy to use, portable, and powerful. Best of all, they all come with a less than $300 price tag. Whether you’re looking for a compact penny board or a larger-than-average longboard, you can find a model that will fit your modest budget.